Pedal a scenic path along the Akerselva River on a 3-hour bike tour of Oslo with a small group and local guide. Discover the city’s landmarks and hidden gems as you wind from the elegant opera house to a vibrant, creative neighborhood full of public art. Enjoy time to browse the stalls at a thriving fresh food market, and see the waterfalls at the heart of the city. Get insider recommendations on the best places to eat, drink and visit in the city while exploring Oslo as the locals do. 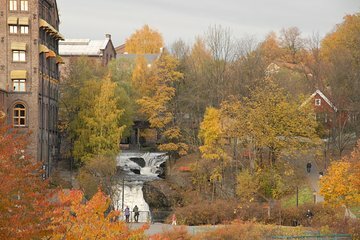 The trail along the Akerselva River in Oslo is the best way to enjoy Oslo if you enjoy the outdoors! The trail passes by artsy and historical areas that you might want to visit again on foot. One of the highlights was the "foodie court" that we stop at the offers a wide variety of ethnic and Norwegian foods in a quant setting. Our guide provided a wealth of information on each of the areas we passed. It was a fantastic way to spend a morning in this beautiful city. The bikes they provided were great and it is a good tour for all fitness levels. It rained a little on our tour so I recommend that you bring rain gear. This was amazing. The tour guide also the owner, Curt, was excellent. He's knowledgeable, fun, and super nice. Totally recommended! Absolutely great way to get around town, fanastic guide helpful and ensure all levels where looked after. We loved this tour. Our guide was very organised, friendly and experienced. He knew his city very well and timed the trip so we moved along but had time to take photos and ask questions. He was interesting and knowledgeable about the history. We saw a different side to Oslo. The bicycles were a good quality with working gears that were clearly explained and made the few hills easy to negotiate. Our guide made us fall in love with Oslo....highly recommend this tour. Oslo is a beautiful city and touring by bike was a fun and easy way to see the sights. Great food stop along the way, and our guide Lena was so friendly and informative. Only one tough, short hill on the ride, but I made it to the top without walking! Which she said had never been done, but I think she was just kidding me! We did this tour with another couple and had a great time! Tuba was our guide and she was awesome and very knowledgeable about all the places we saw and gave us time for photo ops. There were a couple of hills that were a little hard to do, but we were able to do them with a little work. There was one though that was too hard to do and most everyone ended up walking their bikes but the waterfall at the top of the hill was well worth it. I highly recommend this tour for any new visitors in Oslo that want to get a head start on places to see and enjoy doing it while riding bikes through this awesome city. Some of the pictures we took are attached. One of the best tours I've ever been on. Curtis was an extremely knowledgable and fun guide. The views are spectacular, and the physical demand is more than manageable. Highly recommended! This tour was a lot of fun. Small numbers meant it was easy to get to know the other people in the group, and allowed the guide to accommodate everyone without compromising the tour itself. Josh was very funny and had a wonderful personality that made the tour even better. Very nice tour girl. Can feel that she loves her job. She is enthusiastic, initiative to introduce all tour friendly places and shopping centers, and she will not focus on those crowd places with all visitors. Unfortunately my cycling technique is not good, and she is patient to wait for me. For sure will join again if i visit Oslo in future.